In “The Reason for God”, Keller offers the skeptic and the believer an intellectual defense of the Gospel of Christ. I am a huge fan of the object lesson, and while I am of the opinion that Jesus was the master of the object lesson, Keller provides some excellent ones in this book. I knew myself, at the first breath of this new life, to be more wicked, tenfold “more wicked, sold a slave to my original evil; and the thought in that moment, braced and delighted me like wine…(Edward Hyde’s) every act centered on self. Edward Hyde is so named not just because he is hideous but because he is hidden. He thinks solely of his own desires; he doesn’t care in the slightest who he hurts in order to gratify himself. He kills if someone gets in his way. Stevenson is saying that even the best of people hide from themselves what is within–an enormous capacity for egotism, self-absorption, and regard for your own interests over those of all others. Self-aggrandizement is at the foundation of so much of the misery of the world. It is the reason that the powerful and the rich are indifferent to the plight of the poor. It is the reason for most of the violence, crime, and warfare in the world. It is at the heart of most cases of family disintegration. We hide from ourselves our self-centered capacity for acts of evil, but situations arise that act as a “potion” and out they come. Once Jekyll realizes that he has this capacity for evil acts, he decides to clamp down heavily on this terrible self-centeredness and pride at the core of his being. In a sense, he “gets religion.” He solemnly resolves not to take the potion anymore. He devotes himself to charity and good works, partially as atonement for what Edward Hyde has done, and partially as an effort to simply smother his selfish nature with acts of unselfishness. However, one day Dr. Jekyll is sitting on a bench in Regents Park, thinking about all the good he has been doing, and how much better a man he was, despite Edward Hyde, than the great majority of people. “I resolved in my future conduct to redeem the past; and I can say with honesty that my resolve was fruitful and of some good. You know how earnestly, in the last months of the last year, I labored to relieve suffering; you know that much was done for others…(But as) I smiled, comparing myself with other men, comparing my active goodwill with the lazy cruelty of their neglect…at the very moment of that vain-glorious thought, a qualm came over me, a horrid nausea and the most dreadful shuddering…I looked down…I was once more Edward Hyde. This is a deadly turn of events. For the first time Jekyll becomes Hyde involuntarily, without the potion, and this is the beginning of the end. Unable to control his transformations any longer, Jekyll kills himself. Stevenson’s insight here is, I think, profound. 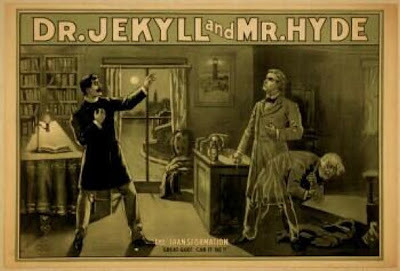 Why would Jekyll become Hyde without the potion? Like so many people, Jekyll knows he is a sinner, so he tries desperately to cover his sin with great piles of good works. Yet his efforts do not actually shrivel his pride and self-centeredness, they only aggravate it. They lead him to superiority, self-righteousness, pride and suddenly — look! Jekyll becomes Hyde, not in spite of his goodness, but because of his goodness. The second is described by Flannery O’Connor, who wrote about one of her characters, Hazel Motes, that “he knew that the best way to avoid Jesus was to avoid sin.” If you are avoiding sin and living morally so that God will have to bless and you and save you, then ironically, you may be looking to Jesus as a teacher, model, and helper but you are avoiding him as Savior. You are trusting in your own goodness rather than in Jesus for your standing with God. You are trying to save yourself by following Jesus. That, ironically, is a rejection of the gospel of Jesus. It is a Christianized form of religion. There’s more, but I’ll stop here and let you soak that in. Maybe you read that and were unaffected; not at all convicted. I have read books others have considered life changing that, while I considered them good reads, did not affect me profoundly – to each his/her own. Over the past two years, my concept of what it means to be a Christian has radically changed. The Holy Spirit convicts me left and right. All other major faiths have founders who are teachers that show the way to salvation. Jesus was the only one to make the audacious claim that He is the way to salvation Himself. As I wrestle with the understanding that orthodox Christianity is not about being good as a means to salvation, but abiding in His will out of a sense of overwhelming gratitude for the salvation that has already been granted, I am becoming more aware of how often I fail to express this gratitude. I don’t want to be lukewarm. Do you? Sin and evil are self-centeredness and pride that lead to oppression against others, but there are two forms of this. One form is being very bad and breaking all the rules, and the other form is being very good and keeping all the rules and becoming self-righteous. There are two ways to be your own Savior and Lord. The first is by saying, “I am going to live my life the way I want.” The second is described by Flannery O’Connor, who wrote about one of her characters, Hazel Motes, that “he knew that the best way to avoid Jesus was to avoid sin.” If you are avoiding sin and living morally so that God will have to bless and you and save you, then ironically, you may be looking to Jesus as a teacher, model, and helper but you are avoiding him as Savior. You are trusting in your own goodness rather than in Jesus for your standing with God. You are trying to save yourself by following Jesus.